Yes. 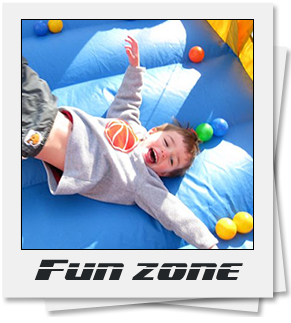 Wonder Jump, Inc. carries a liability policy on each of our units. All Inflatable’s should be set up on a level grassy area. Allow 6 feet of clearance on each side of inflatable to ensure safety. Is power or electricity required? Yes. The blower/fan plugs into a standard electrical outlet. If power is not readily available, a generator can be rented for a nominal fee. Power must be within 100 feet of the blower/fan. How expensive is it to have the blower running constantly? Wonder Jump uses the highest quality blowers in the industry and the cost to operate a blower is less than $1.00 per day. How many people can bounce? Capacity varies based on ride. Slides should not have more than 2 Individuals at a time. Please refer to Safety Rules Section to review for further information. Because the units run on electricity, they cannot be set up in the rain. If it looks like rain and you wish to cancel, there is no charge to cancel or reschedule. If delivery is made, however, we cannot issue a refund. We take pride in maintaining very clean equipment. Before Each Rental each unit is disinfected with Lysol® after each rental. Yes. An adult must be present to supervise each unit. We recommend one of our trained professionals for a nominal fee to supervise your moonwalk or inflatable. Yes. Our comprehensive liability insurance policy allows us to set up in most metro parks, state, and community parks. Most parks require prior notification that your party will have a moonwalk. They can be notified at the time of your party reservation. We accept cash, checks, Visa, and MasterCard. We ask for a 50% deposit to reserve your moonwalk/inflatable. Many companies will over-book moonwalks and then explain to the customer that they did not have a deposit on a unit. Our policy guarantees a unit reserved just for you. Credit card payments must be made via our website at least 3 days prior to your delivery date. Credit card payments cannot be taken at time of delivery. Now. Often, units are booked far in advance, and selection diminishes. Your best time to reserve is now. Looking for the right item? Not sure which item to choose? Give us a call and let a party specialist guide you. Already know what you want? Sign in and place your order. A Representative will call you and confirm your order. Have Questions? See our FAQ’s. How much space do I need? Does this inflatable include set up? How do I order? Not sure what you need or still have questions. Use our contact form and get answers.